"Does it rain in other dimensions?" asks the front cover of this new book about UFO/alien contact. The answer? No: just up and down. LOL. Okay, that's just my wife's little joke. It's certainly an unusual book title, and grabs your attention, almost as much as the bizarre looking alien chap (chappette?) who stares out at us from inside the circular window. A 'window' which is surrounded by strange symbols. All becomes revealed as the book proceeds, and it is a story of high strangeness indeed! Mike Oram is an English contactee who has personally experienced the unknown since a small child. Indeed, since that tender age he has been aware of an other-worldly aspect to his being. The book starts off as an autobiography, detailing Mike's repeated UFO contacts in Warminster, and his upbringing in the south east of England. It catalogues various bizarre encounters he experienced as a child, encounters which were often witnessed by other people, mostly family members. UFOs appeared over his house periodically, and these were seen by people close to the author on several occasions. They were aware that Mike seemed to be the centre of some kind of alien interaction, not least because Mike himself was claiming this vociferously from the age of 4. There's plenty in this account for psychologists to get their teeth into, of course; some of Mike's best writing exposes some of the deprivation he and his family suffered in post-War Britain. The school he attended as a teenager was clearly out of control, and was a dangerous environment for a youth with his head in the clouds, as Mike clearly was. Bullying was an ever-present danger, and many would argue that Mike's encounters acted as a form of escapism, or wish-fulfilment. But this would be a position which would entirely ignore the evidence Mike presents regarding the communal witnessing of his alien contact. Evidence which is particularly strong. Mike is a gentle soul, and comes across as an entirely honest one too. His reactions to his contact ring true; the way contact becomes an intrinsic, natural part of his life. It reminds me of the way mediums take their encounters with ghosts entirely in their stride. And the similarities don't end there. A spiritual aspect is notable almost throughout; a distinct lack of threat to the experiencer which provides the confidence to live with the knowledge that on any particular night a visit might happen. Mike does describe hostile encounters too, but these are the exception rather than the rule; night-haggish entities make appearances with terrifying consequences. But generally, the aliens are spiritual space brothers, in keeping with the famous Contactee encounters several decades ago. Mike enjoys the encounters, and learns a fabulous amount from them, enriching his life. About halfway through the book the chronological monologue ends, and the text begins to become patchy and convoluted. Mike's partner, Fran, provides a series of what would normally be footnotes or appendices, which in this case appear in the body of the text. It reminds me of American TV where adverts suddenly appear in the middle of the programme you're watching. Sometimes these interpolations were useful, sometimes they become unnecessary sidetracks. This needs a bit of editing. But in all other respects, the book is well presented; there are few errors, the prose is simple but fluent, and the story flows well. The latter chapters of the book worked through some hypnotic regressions, and I felt myself seriously detaching through these. I don't have a problem with hypnotic regressions per se, but these examples seemed very unscientific in character. The information that came out of the regressions did fill out various gaps in knowledge, to be fair, but it was very difficult to judge what was going on here objectively. I felt like the book became an effort to persuade the reader to buy into the whole story, hook, line and sinker, rather than presenting a series of fascinating, and clearly connected, encounters. From rather down-to-earth roots, we were moving headlong into the New Age/Conspiracy Theory field as the text progressed. I particularly found the communications from the alien entities to be banal, and lacking substance. Surely higher beings would have something more interesting to impart, to teach those in whom they show such keen interest? Now, many readers of this book may not have a problem with this shift into the New Age field. After all, if you accept alien visitation, abduction and UFO reality, then surely it's time to explore some of the more spiritual aspects of Ufology too? I think this book will appeal to people who would agree with this viewpoint. You'll not be disappointed if you do. I won't spoil the book by describing some of the later content, but it is whacky indeed!! If there is such a thing as Political Correctness in Ufology, then I should point out that 'who are we to judge?' Maybe this is all for real, and multi-dimensional existence of high strangeness is the true reality. But my own mindset is less quasi-religious, and more empirical. I don't require absolute proof, but I need to make sense of it all, to be able to rationalise the experiences in my mind. To understand the motivations of the alien presence; what drives their contact; what prevents their landing on the White House lawn. Perhaps my own failing here reflects the wider public mood about Ufology right now; it has shifted too far into the fringe. 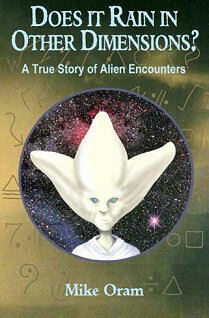 Mike Oram's book seeks to explore alien contact from a very human perspective; it is a remarkable and enjoyable tale. I would certainly recommend any skywatch that he might be participating in! "A True Story of Alien Encounters"